They're only slightly less computer savvy than I am. Welcome to the 21st century, Farmgirl! Wow. Who knew computer technology had come so far in ten years? Who knew how much better my daily farm photos would look on a fancy flat screen? Who knew it was going to be such an ordeal to set up my brand spanking new computer? Yep, I'm typing this on my wonderful new computer. I'm still pretty much blogging blindly, but now I look a lot better doing it. I can also blog around a little more quickly, though our speed is limited by a dial-up connection—which I didn't think was a big deal until the other day when a friend said, "You have a website and you're on dial-up?" and burst out laughing. DSL? Cable? Never gonna happen out here. I'm just thrilled we have a local dial-up number. The arrival of a new computer is definitely cause for celebration. I decided I would make a batch of my Crazy Cookies and rename them Crazy About My New Computer Cookies in honor of this exciting event. But when it was pointed out to me, quite rightly, that my new computer has also been driving me crazy, well, I realized the original name was actually perfect. 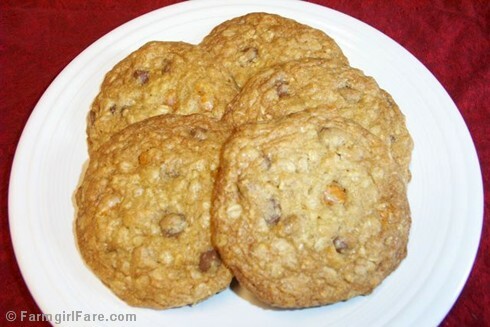 These are big, soft cookies that are easy to make and always get rave reviews. As always, I urge you to seek out local and organic ingredients whenever possible. Enjoy! Melting the butter allows you to skip getting out the electric mixer. It also makes the cookies softer. I simply place a large, stainless steel mixing bowl directly on a gas stovetop burner, set it on low, and melt the butter directly in the bowl, then mix in the rest of the ingredients using a large rubber spatula. If you can't find butterscotch chips, you might try substituting peanut butter chips or white chocolate chips. Or probably anything else you can think of--this recipe is versatile! I use unsweetened, organic coconut in any recipe that calls for sweetened flaked or shredded coconut, and have always had great success. It's tasty, inexpensive, doesn't contain any scary ingredients, and can usually be found in the bulk section at natural foods stores. I highly recommend investing in a couple of heavy duty commercial rimmed baking sheets. At less than $14 each, they're one of the best kitchen deals around. Treat them well—I usually line mine with sheets of unbleached parchment paper, which is wonderful stuff—and they'll last for ages. I've been using the heck out of some of mine for 20 years for everything from baking scones to roasting Brussels sprouts, not to mention thousands of cookies. Heat the oven to 350 degrees. Line a heavy duty baking sheet with unbleached parchment paper,. Stir in the flour, salt, and baking soda (combine these together before adding in if desired), mixing just until combined. Stir in the oats, chocolate chips, butterscotch chips, pecans, and coconut. Cool on a wire rack. Serve warm or at room temperature with glasses of very cold milk. Personally I think they taste even better the second day. And, as with nearly all cookies, they freeze beautifully. Just put them in a zipper freezer bag and toss it into the freezer. I would not have guessed that you are computer-literacy-challenged. You cover it well. Have you ever looked into satellite for a high-speed connection? The Geek and I won't be able to get DSL or cable at our new place, but we are considering satellite. If we have to go dial-up we'll survive, but with him dialing into work regularly and me doing website updates for a couple of clients, it would be a real challenge. As for the cookies, I'm not a chocolate girl myself, but I'm thinking the hubby might enjoy them! On his behalf, thanks for the recipe! oooh! They look great, mine had butterscotch and walnut, and some nutmeg and cinnamon. yummy looking cookies, the cutest little sheep and beautiful chickens...what nice 3 posts :) Susan, I will definately be baking those cookies when I can get to the city to get the natural goodies for them. I am out of natural coconut and good white chocolate. Now on to the baby girl sheep ...I want her ! oh my is she adorable. And I also want the chickens...I love chickens , I have the coolest book called extraordinary chickens. Plus to have real eggs to bake with would be great. Can you tell I am feeling a bit back to normal Thanks for all your support. I'm so glad you got that new computer set up and are loving it!! Thanks for the cookie recipe, and I agree with Clare. Those chickens could NEVER keep up such a great-looking blog. You and the computer will make peace. It took me about three year before my little laptop and I finally came to an agreement. She would do what I say and that was that. You just gotta show the computer whos boss, don't let her say how pretty she is or anthing! That's just a diversion. You are the boss and a angel those cookies look so good! Yes, definitely try making the cookies--and let me know how they come out. Thanks for the Blogging By Mail reminder; sounds like it's going to be quite an event! Well, thank you. Haven't looked into satellite connection--thanks for the tip! Hmmmm. Not a chocolate girl? Are you sure you're a girl? : ) Actually, consider yourself lucky! Hope the hubby likes the cookies. And you could always make them without chocolate. That was so funny that we both unknowingly made oatmeal cookies with butterscotch chips at the same time. Yours looked scrumptious! So glad to "hear" your happy voice! Definitely let me know how the cookies turn out. As for that cutie pie lamb, as soon as I figure out which one she is you can certainly have her! I think all my sheep are adorable, but they really are irresistable when they're babies. I will pass your chicken compliment on to Joe, as those are actually his "thrifty" chickens. I do have to admit they're rather photogenic. My girls are gorgeous, but they never want to pose for pictures. Yes, having fresh eggs is wonderful. We will be ordering some chicks this spring, as we are down to only 5 old hens now, and they don't lay much. When we had 28 chickens we were getting about 10 dozen eggs a week! Heaven! I will have to look up that chicken book you mentioned. I haven't tried it, but I bet those cookies would taste pretty good with 1 cup of whole wheat flour substituted for 1 cup of the all-purpose. Hmmmm. Let me know if you try it. Wendy, you're killing me. Thanks for a morning laugh! I added memory to my computer 15 days ago. Now it is a beautiful computer and I did not think of celebrating it. I am going to make it by making these cookies which seem so delicious. I use a commercial scoop (sometimes called a "disher") that will hold 4 fluid ounces of water (I think that's around 60 ml). The finished cookies are about 4-1/2 inches in diameter. So crazy, so flavourful, so enormous, so beautiful. I had never eaten so good cookies before. We all loved your recipe. Thank you. I discovered your blog thanks to Mijo. I made your receipt yesterday, those cookies are wonderful. Some of my friends tested them and they really appreciate. hey, farmgirl. i'm lydia. i've been frequenting your site for a couple of weeks now. i've made the beer bread, lentil soup with sausage, and these cookies. my husband has gone nuts for all three. the soup i made with italian buffalo sausage because that was what i had around and most of the other ingredients were staring out at me from the veggie bin begging for last ditch clemency, "please please please put us into a stew or a soup! 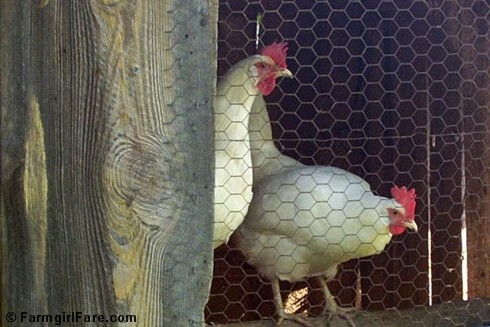 please don't cast us out to the chickens, we are still EDIBLE!" i made the beer bread with all whole wheat flour, a red ale, cheddar cheese, and fresh herbs, and it was excellent. i was amazed at how much it rose! it was no bludgeon, just pretty light and fluffy. and i served it with one of our chickens that i brined for a day in advanced and root veggies that roasted in the pan with her. and the cookies, well let's just say that my husband thinks he's sitting on a goldmine with a whole huge bag of them sitting pretty in the freezer. i presented them to him while he was doing tractor work. he is most pleased with himself when atop of a tractor (boys with their toys)-- add cookies to that... watch out! i appreciate how flexible your recipes are. living over an hour from my food co-op and 25 minutes from "the store" (basically a gas station, liquor store, hardware store, mini market with some forlorn produce), i have to just make do with what i have on hand. it usually turns out well, and i am forced to waste very little. my husband and i moved out here a couple of years ago from the city. we raise dairy goats, hair sheep, and chickens, and we have some riding mules coming to us. we've been at this for a much shorter time than you, though, and are still pretty green. so, i appreciate your insight and your tips. and i can just relate so well to some of your stories; like how it can take a whole day to move six little sheep! and the things you do out of desperation and the fact that there no neighbor to observe your eccentricity/madness! so, thanks, farmgirl. I thought you sounded familiar. : ) Loved reading the second intro. So glad you are having such success with my recipes. And I'm envious of your riding mules!